Transmission Access Charges (TAC) are fees designed to pay for the state’s transmission system, operations and maintenance, amortization of capital, and return-on-equity. TAC add about $0.03 per kilowatt-hour (kWh) to the levelized cost of energy over a 20-year contract, which is about 30% of the wholesale value of energy in California. Energy Policy Reform has been the key to unlocking value and realizing the multiple benefits distributed renewable power generation and smart grid technologies offer society. When it comes to revising existing and crafting new power and energy market rules and regulations, it’s a brave new world, however. For instance, California’s investor-owned utilities (IOUs) who operate long-distance transmission networks have a strong vested interest in lobbying to assure they continue to play the leading role in power markets. California’s IOUs have been quicker, and more proactive than most in helping realize the Golden State’s renewable energy and clean tech goals. That said, the ̈devil is in the details. ̈ What at first glance may seem small aspects of existing regulations or proposed reforms can have far reaching impacts that wind up serving as detours on the path to clean energy. Case in point is the Transmission Access Charge (TAC) tacked on to ratepayers’ electricity bills, including locally used distributed power generation, according to the Dynamic Grid Council (DGC). 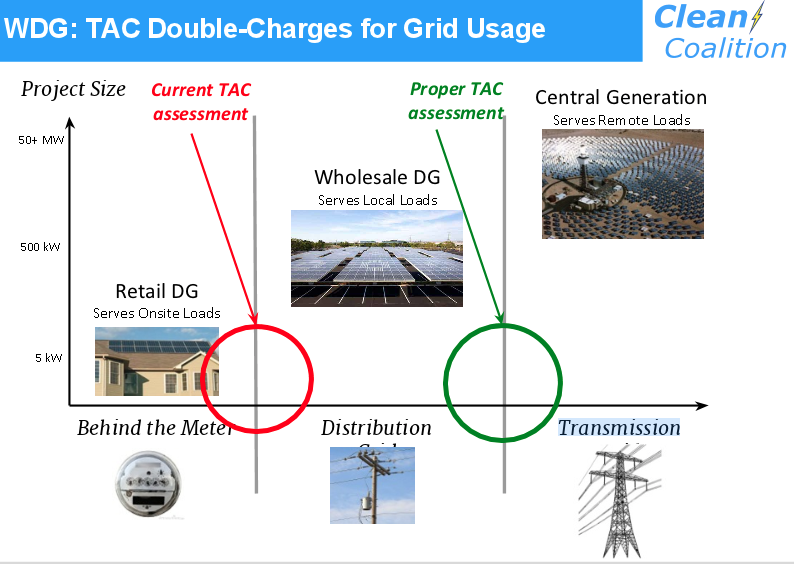 The method used to calculate TACs is artificially reducing demand for distributed generation and artificially increasing demand for additional transmission resources, DGC executive director Daryl Michalik told the CAISO Board of Governors at a recent hearing. DGC is working to change this as a member of Clean Coalition’s TAC Campaign. Current TAC assessment practice winds up costing Californians in at least two important systemic respects: it reduces uptake and use of distributed solar and other renewable power generation, which results in higher greenhouse gas emissions, and distorts market pricing. The crux of the problem is that Participating Transmission Owners (PTOs) assess TAC based on metered customer load instead of on metered transmission load, Michalik explained. That means PTOs pay TAC on every kWh delivered at the customer level, even if that energy was not delivered through the transmission system. To align costs and benefits, TAC should only apply to energy that is delivered through the transmission system. Therefore, TAC should be calculated based on the metered transmission load as measured at the transmission substation and distribution substation, where energy down-converts from transmission grid voltages to distribution grid voltages, Michalik elaborated. But it’s not. As a result, ratepayers TAC are added for power that doesn’t use the transmission system, ie power that is used on-site or delivered over the local distribution system to nearby customers. The current TAC assessment on every kWh of metered customer electric usage, instead of on metered transmission load, creates a major market distortion. 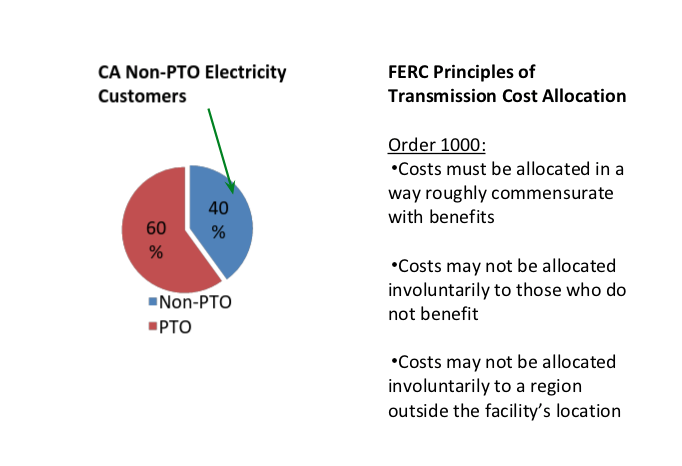 The transmission cost savings of local wholesale distributed generation are denied to ratepayers, local generation is denied fair market competition, and communities lose the benefits of local energy development. Wholesale distributed generation (WDG) of electricity connected directly to the distribution grid are among the renewable energy producers penalized unjustly by TAC as its currently assessed, according to DGC. These power producers serve local loads and in general do not use the transmission system, Michalik pointed out, instead only using the distribution grid to deliver electricity. Furthermore, WDGs already pay all of the cost associated with their use of PTO distribution grids and transmission systems, such as those associated with interconnection, he added. 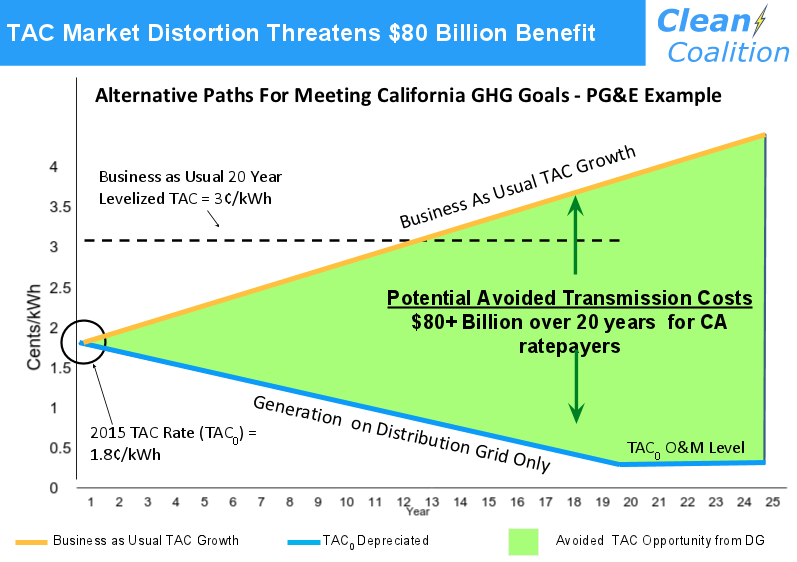 Therefore, adding TAC to the cost of WDG energy means WDG pays for both distribution and transmission system upgrades, and WDG is double-charged for its use of grid resources, Mihalik told CAISO’s board of governors. In contrast, power generation connected at the transmission system and delivered over long distances to customers doesn’t pay for distribution upgrades, and it’s fully refunded for approved upgrades. These costs are passed on to ratepayers via TAC. TAC’s assessment method should be changed so that either charges are not added to the cost of WDG or centralized generation should pay for the distribution grid, DGC says. In addition to WDG, Calfornia’s Green Tariff Shared Renewables (GTSR) program is harmed by TAC’s current assessment method, according to DGC. The trade group points out that GTSR isn ́t supposed to shift costs to ratepayers. It winds up doing so because TAC charges are imposed on all GTSR participants even though most participants are local and do not use the transmission system to deliver electricity to end users. ̈Those subscribers will pay more than they should, because the cost of GTSR includes TAC, ̈ Michalik stated. DGC wants CAISO to change PTOs’ TAC assessment method so that charges are calculated based on metered transmission load, which would align charges with causation. The principle of assessing transmissions proportionately among those who directly cause them is a fundamental principle that forms the basis of power market rules and regulations. Now is an opportune time for CAISO to do so, DGC says. ̈If as a result of expansion, CAISO assesses TAC on a third level, or 300kV+, without fixing the TAC assessment methodology, CAISO would be expanding the current market distortion, ̈ Michalik pointed out.